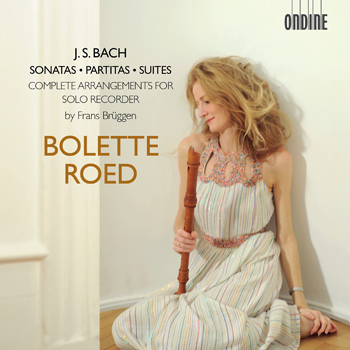 This new Ondine release by Danish-born recorder player Bolette Roed includes the music of Johann Sebastian Bach (1685–1750) arranged for solo recorder. The works were arranged by Frans Brüggen (1934–2014), famous Dutch recorder player and conductor who was of the greatest importance to the movement of the historically informed performance practice. With the exception of his Partita BWV 1013, Bach wrote relatively few works for the recorder. However, composers like Bach and Vivaldi did themselves arrange many of their works for different instruments. From this point of view the work of arranging Bach’s solo cello and violin pieces for recorder is something what Bach himself could have done, had he been inspired by a talented recorder player himself at the time of his compositions. For this recording several different recorders were being chosen. For the 11 movements written for the violin original keys were kept by changing the recorders accordingly. The cello suites are being played by one recorder only by transposing the original keys down a minor second. Bolette Roed is an award-winning artist who regularly performs with major Danish orchestras as well as with early music ensembles and baroque orchestras in various countries. Bolette Roed strives to extend the instrument’s repertoire beyond its established role in Early Music, towards new frontiers of improvisation, folk, and world music. Roed further aspires to adapt canonical classical works to the recorder and stays in constant dialogue with and commissions new works from today’s composers.